"Got sent off on my first game. Mourinho killed me. 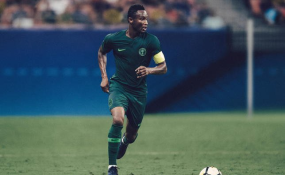 The speed of the game took me a while to understand it," Mikel said in an interview with the BBC World Service's Sportsworld. Mikel joined Chelsea in 2006 from Lyn Oslo as a 19 year-old off an impressive performance at the 2005 U-20 FIFA World Cup in Netherlands, where he finished the tournament as second best player, only behind Argentina's Lionel Messi, who led the Argentines to lift the trophy, defeating Mikel's Nigeria 1-0 in the final. "I was a very naughty boy," Mikel said "I'll get up to speed but I was late to trainings many times. I was wearing the wrong dress codes." "Mourinho was very firm with me because he wanted me to learn and learn very fast because he brought me in." According to him, "With Mourinho, there are no excuses. I was put in a very naughty corner a few times. It took me a while to understand where I am and I had to learn very fast."